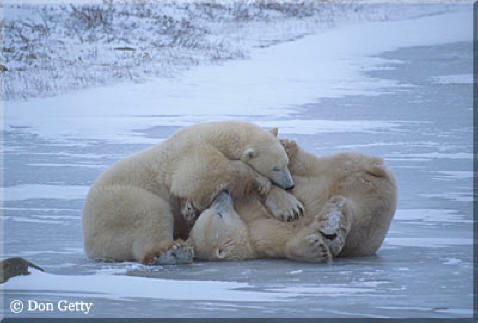 If you’re a nature photographer you undoubtedly have heard about Churchill and its concentration of Polar Bears. Either you’ve already been there or would like to go. After many years of telling myself that some day I would get there, I’ve made two trips in three years and regret not having gone years ago. 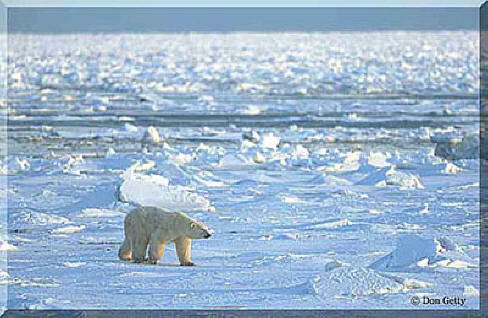 In the fall Polar Bears congregate in the Churchill area because it is one of the earliest spots where Hudson Bay freezes over. This is significant because the Polar Bears spend the winter months on the icepack hunting seals, their primary food source. They don’t get much to eat from when the icepack melts in the spring until it develops again in the fall. Polar Bears make excellent photo subjects. They are very active and generally not scared off by the tundra buggies or the people in them. 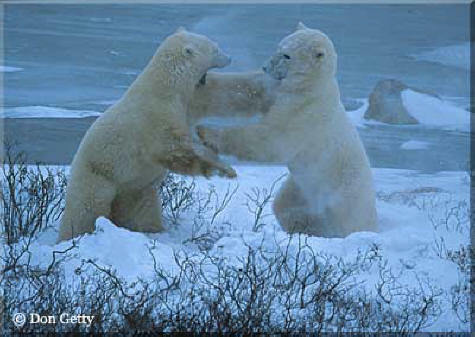 Males of relatively equal size tend to pair up and play fight. I never timed a fight but I bet they keep going for twenty minutes or more. When they tire or overheat, they lie down for a break. 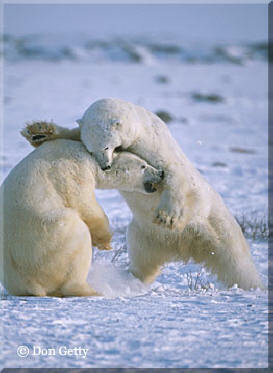 Then one will get up to provoke the other and the fight is on again. Although bears are the stars of the show in the Churchill area, you can find other wildlife subjects such as Arctic Foxes, Ptarmigan, Snowy Owls and other birds. Sunsets can also be dramatic. 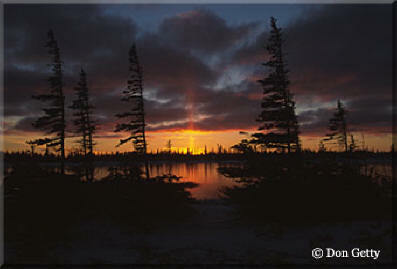 There are many small lakes and stands of trees to use in sunset compositions. When standing at your tripod waiting for the sun to set with the wind blowing, the cold can be a test of how badly you really want the photo. The timing of a trip to Churchill can be critical. Arrive too early and you’ll be photographing bears in the mud, too late and the bears will be gone. The tour season runs from early October to about November 20. I’ve heard the big name pros say not to go before November 1. My first trip was from November 3rd to the 11th and the conditions were great. My second trip was from November 11th to the 20th. That year the Bay froze over the earliest that it had in 30 years and most of the bears had already gone when I arrived. The week before had apparently been awesome. The year before, the bears were good until mid December according to our driver/guide. Since you can’t very well plan a trip at the last minute the timing will always be a bit of a gamble, but early November is a good bet. There are two ways to get to Churchill, both from Winnipeg, Manitoba. You can fly or take a train. The train runs 3 times a week and takes 36 hours to cover 1,000 miles. There are several flights each day that take about two and a half hours to cover the 600 plus air miles. The choice is yours. No, you can’t drive yourself there. Churchill is a small community of about 1,000 people with tourism as its primary industry. It has about eight small hotel/motels, a handful of B&B’s, two grocery stores, a liquor store, bank and one gas station, which is closed on Sundays. There’s a modern community center/complex housing a hospital, school, library, hockey rink and government offices. There are about eight restaurants, several of which are quite good and dinner reservations are recommended. Gift shops abound. The locals are very friendly and within a few days you start running into familiar faces around town. You won’t find a camera store so bring plenty of film and batteries with you. Access to the Polar Bears is by custom built tundra vehicles. There are about 20 of these vehicles operated by two companies. They are similar to school bus bodies mounted on airport fire truck chassis with tires five feet tall. On the rear of each is an open deck. They have "facilities" a step up from an outhouse and a large propane heater. For photography the heaters can be a problem since the heat waves rolling out the window past a lens can actually create some distortion in images. I’d keep the heater going, but just enough to keep you relatively comfortable. If you’re so inclined, you can pack a little brandy to help fend off the chill. Photography can be done from the windows or the rear deck. The driver/guide will kill the engine to avoid vibration. For shooting from the windows I use a Groofwinâ window mount with a large beanbag attached. A tripod should be used on the rear deck, but with more than about three or four tripods out there it can get a little crowded. If the wind is blowing, a crowd on the deck probably won’t be a problem. I have done more shooting from the windows than the deck. For lenses I carry a 500mm and a 100-400 zoom, which covers most situations. A 300mm is adequate if that’s your largest lens. The bears will get close. In fact they seem to be attracted to the vehicles and will often get too close for good composition. Don’t dangle arms or camera straps out the windows or you could loose some valuable equipment. Extenders are also handy for photographing smaller subjects such as arctic foxes and birds. A minimum of two camera bodies is highly recommended. Although I’ve never had a problem, the cold can cause malfunctions. I helped a fellow photographer whose camera wouldn’t rewind properly by attaching a chemical hand warmer packet to the back of her camera with rubber bands. It actually worked. The cold can also be tough on batteries. The AA lithium batteries I use have worked well but I carry more spares than in warmer climates. 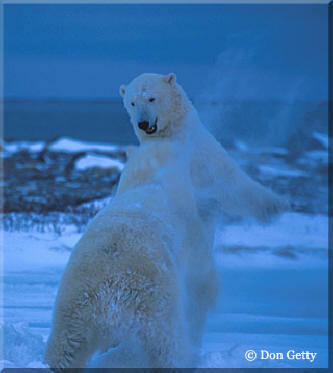 Some might think that photographing white bears on snow would cause exposure issues. No problem. I use manual spot metering, meter the snow and open up about 1 and a half stops on a clear days, 2 stops if it’s overcast. There are many overcast days when I push 100 ISO film to 200 for a little more speed. For film, if you still use film as I do, plan on 20 rolls per day to be safe. Yes it is cold way up there, but not unbearable. Most important is a good pair of extra warm boots. If your feet get cold you will be miserable. When photographing I use thin glove liners with fingerless wool gloves. I also use chemical hand warmer packets, which are a gift from heaven if your hands get cold. Long underwear, flannel lined jeans, fleece shirts, a fleece jacket, wool socks, a warm hat and gloves are the basics of the clothes I take. I’d also recommend a big warm hooded parka for standing out on the rear deck of the buggies and when walking to dinner or around town. If you’re one of those nature photographers who haven’t been to Churchill, I recommend that you schedule a trip and I hope that you enjoy it as much as I have. Don Getty is a part-time wildlife and nature photographer who has photographed extensively in East Africa, Alaska, Florida, and the Rocky Mountain West. His images have appeared in books, calendars and magazines including: Outdoor Photographer, National Geographic Kids, Your Big Back Yard, WildBird, Birder’s World, Wyoming Wildlife, Animals, Nature Photographer, and Wildlife Conservation. 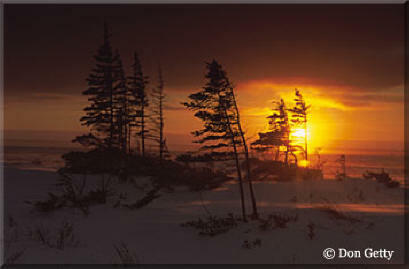 To view more of Don’s photographs go to his website at www.DonGettyPhoto.com.